How to recover lost data safely from a Android Phone? Summary:Is your Windows computer not recognizing your USB Flash Drive and prompts “the USB flash drive not showing up”? How to fix it? This article introduced ways to fix USB flash drive not showing up issue in Windows without losing data. Summary:How to format a USB Drive on Mac？Want to erase data from the hard drive? This tutorial article will tell you how to format USB drive on your mac without losing data. Summary:Have you ever lost data in your Android phone suddenly? for example pressing delete button by mistake, formatting memory cardIf you want to recover your data from your Android phone, a best Android data recovery program is your best choice. Summary:Bitwar Data Recovery for Mac helps recover data from Mac OS X. It is the best mac data recovery software. You can free download it on this article. Free download SD memory card recovery software full version crack with serial key, license code, key generator, serial number, keygen, kickass, registration key or activation code? Here's a free and safer alternative SD memory card data recovery software can help you. How to get SD card data recovery software free download full version with crack? There are many pirate websites claimed they could offer SD memory card recovery software wizard pro crack with a license key, however, most of you will waste of time on pasting it to the software and found that license key is invalid or has been used already. An even worse situation that you've found virus attack or Trojan infection after you launched the cracked SD card recovery software. We know that you are willing to free download SD card data recovery software full version to recover the lost document, video, photos, etc. But it's not smart choice to download the cracked software from the pirate websites as the reason you must take the risky on exposing your computer to the dangerous situation. Then what should we do once found lost data from SD card? First, we need to know that losing data from SD card isn't terrible, once found lost data from SD card, we have to make sure not to use the SD card anymore before successfully retrieved lost data. In the meantime, stop downloading or using the SD memory card full version crack to prevent further data loss on your computer. No matter how expensive to purchase the license key from the data recovery software, it's not the reason to use Cracked SD recovery software! And indeed, we can provide you the 100% free and safer data recovery solution. Bitwar Data Recovery Software is such powerful data recovery tool that we would like to present to you, which is completely copyrighted data recovery software and most important, it's 100% free and you can even recover unlimited amounts of lost files from your SD card, hard drive or any supported storage devices. How to use Bitwar Data Recovery Software to recover lost files from SD card? Bitwar Data Recovery is powerful and reliable data recovery software that is capable of recovering photos, documents, videos, audios, archive files, etc. after accidentally deleted or formatted from the PC/Laptop, hard drive, SSD, external disk, USB flash drive, SD memory card, pen drive, ZIP drive or digital storage medium. With a step-to-step interface, every newbie or green hand can operate the software easily and quickly to recover lost files & data as they want. 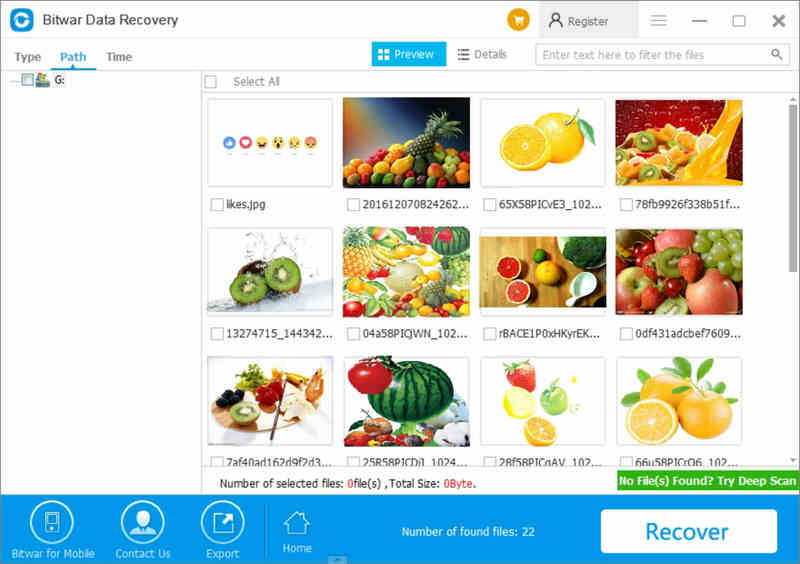 Simply download the Bitwar Data Recovery Software by clicking below button or visit our official website: www.bitwar.net, after that, please install the software to the computer hard drive and double-click the software icon from the desktop to launch it. Step 1. Select the SD card from the index page of the software and click the Next button to continue. Step 2. Choose the Quick Scan and then choose the exact file types in the next step. Step 3. Double-click to preview the lost files and then tap Recover button to save the files to the computer. Tips: Preview the lost files is a way to confirm whether the data is completely for recovery. Once confirmed the files can be previewed as normal, you can then save the files to the computer and after fixed the SD error, you can then copy the files back to the SD card. Bitwar Data Recovery offers initial 30 days free trial that everyone can recover unlimited amounts of lost files during the trial, you just need to register the account and share the software to one of your PUBLIC profiles, such as Facebook, Twitter, Google+, you'll then get the VIP license automatically. Thus, there's no need to use or free download SD memory card data recovery software full version crack. Bitwar Data Recovery software is the best data recovery solution for you. Summary：SD card won't read or open on your computer? In this guide, you will find how to fix the “computer cannot read SD card” error step-by-step. If you worry about a data loss, try Bitwar Data Recovery software to rescue them.